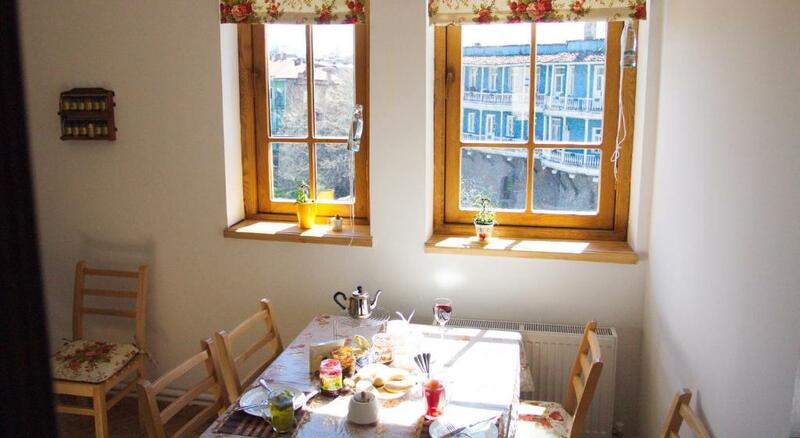 Lock in a great price for Pushkin 10 Hostel – rated 9.6 by recent guests! Extremely friendly staff, they had all of the information you could possibly want about the surrounding area and even shared some homemade wines. The beds were comfortable with a curtain, and great bathrooms! I liked the pushkin 10 hostel receptionists. They are always there and ready to help, and espcially just listen to you as a guest. Kudos to Kate, Alina, Sophie,( i hope i did not miss anyone) and also to the owner Mr. Alex. Also the common living room is big enough to accommodate all the people. The kitchen is so accessible. Also, the balcony for view of the city and for smoking is really amazing The location is very strategic. You can easily get off and get on in a bus 37(airport bound). Near to Carrefour and easy to pass to all the nearest walkable sites. Washrooms are always clean and manage very well. Good value for the money. The staffs were approachable and kind. The location is great. everyone working there is nice and very helpful and location is great! Our last 2 days in Tbilisi was spent at Hostel Pushkin. I instantly fell in love with the place because of the building structure, moreover, they have a balcony where you dan smoke and a very scenic overlooking mountains, churches, old houses and the streets. The hostel is also very cozy. They sell beers and other beverages if you just like to chill in the common area. They also have free pancake for breakfast and coffee. I just wish i brought chocolate chip cookies for my pancakes. The staff were helpful giving some tips and calling our cabs on our last day. 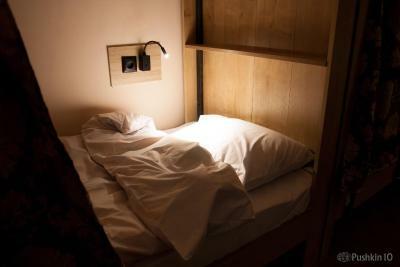 I will deffo gonna come back at Hostel Pushkin and will be highly recommending this to you guys. It is worth the stay, clean, chill and pleasant hostel. All good. Perfect location. Good hostel. Very friendly staff. 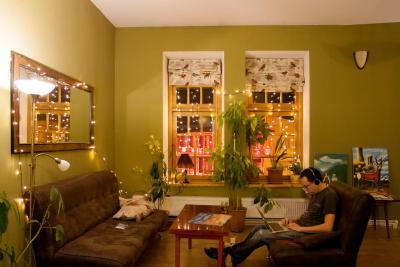 Located in Tbilisi, 1,000 feet from the Freedom Square, Pushkin 10 Hostel offers a terrace, lounge area and free WiFi. 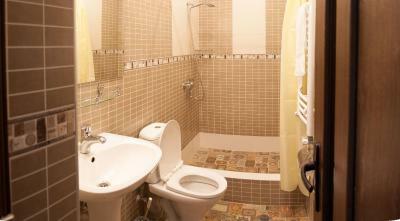 Air-conditioned rooms come with shared bathroom facilities. Breakfast with pancakes and many varieties of toppings, milk and hot tea/coffee is served every morning, and guests can also cook in the shared kitchen. 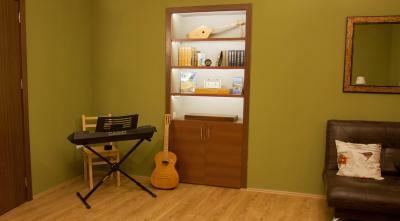 24-hour front desk is available at Pushkin 10 Hostel. Car hire and bike rental services are also offered. 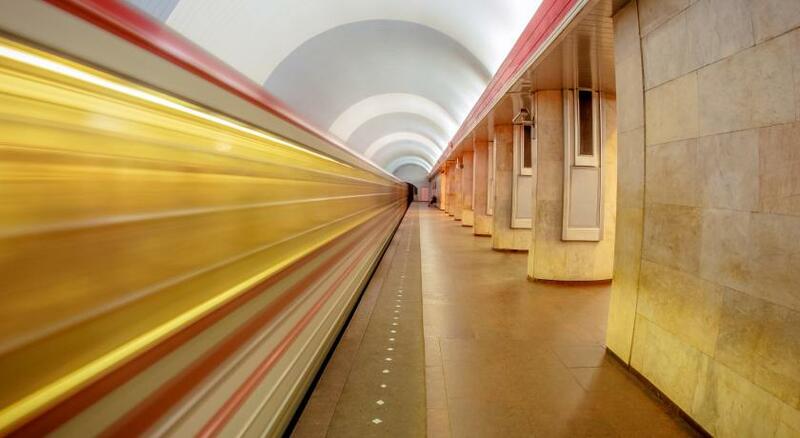 Tbilisi Train Station is 5 mi away, and Tbilisi International Airport is 11 mi from Pushkin 10 Hostel. 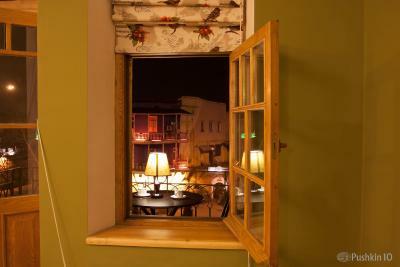 Mtatsminda is a great choice for travelers interested in wine, traditional food and atmosphere. 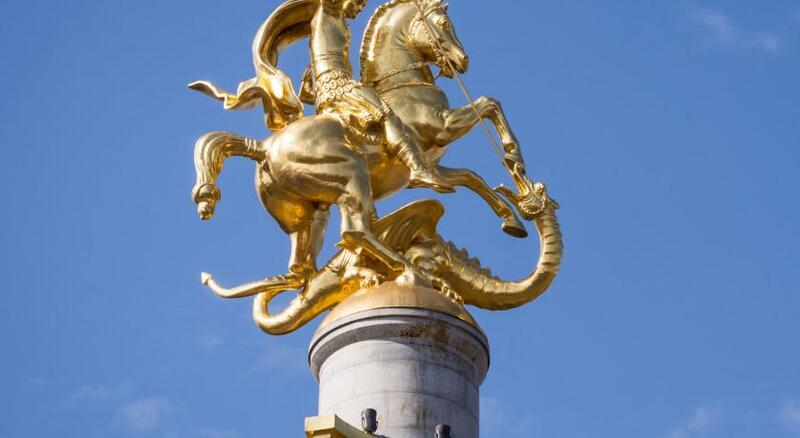 This property is also rated for the best value in Tbilisi City! Guests are getting more for their money when compared to other properties in this city. 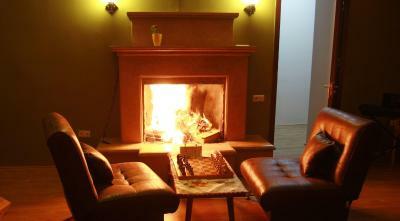 뀐 Located in the real heart of Tbilisi, this property has an excellent location score of 9.8! 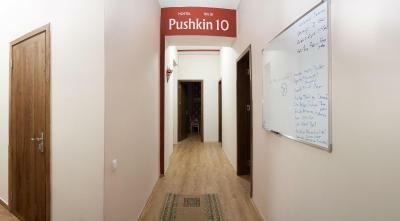 When would you like to stay at Pushkin 10 Hostel? Offering a safety box, this carpeted floor room includes a wardrobe. 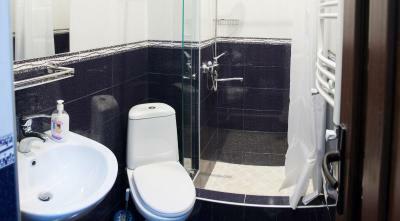 Guests of this room type can use shared bathroom facilities. 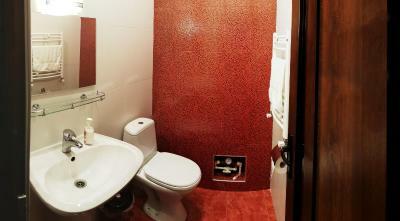 Featuring city view, guests of this room type can use shared bathroom facilities. Guests of this room type can use shared bathroom facilities. The building we are located in was built in 1910 and originally was a hospital. 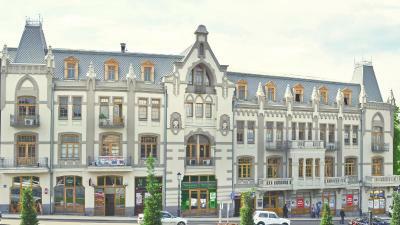 Currently it is one of the most beautiful buildings in the very centre of Tbilisi with unique view from its spacial living room and balcony. Area Info – This neighborhood is a great choice for travelers interested in wine, traditional food and atmosphere – Check location Excellent location – show map Guests loved walking around the neighborhood! 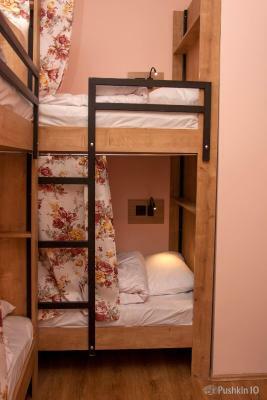 House Rules Pushkin 10 Hostel takes special requests – add in the next step! The absence of an elevator especially on my departure as my luggage contained 5 bottles of Georgian wine, in addition to other souvenirs!! But this was not really a problem as the taxi driver came up to help me with the bags. The pancakes were delicious! And the staff - the three girls at the reception - were very helpful. The location is excellent. Beware of money changers downstairs, a couple of them are known scammers. 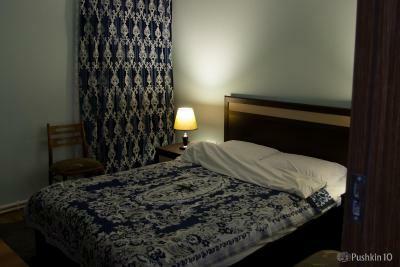 Excellent location, friendly staff, comfortable bed (curtains for each bed for privacy). They also have a fridge that sells local beverages (wine, chacha, juice) if you happen to need a drink in the middle of the night! Everything was perfect. Staff was great. Hostel is very clean and it has a perfect location. Its is amazing place, well located, very clean. Staffs are fabulous, star make for the russian lady from the reception who tries to help you all the time. The best hostel I stayed in my life. I highly recommend it. The only thing I didn’t like is, thehostel is on third floor of the building and there is no elevator. So you need to carry your luggages. 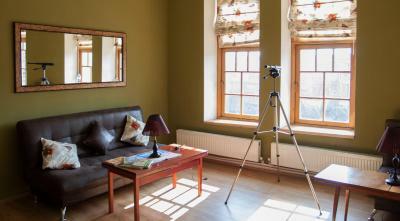 Location was good, staffs are friendly, comfy and clean room and facilities. Free breakfast is really great. While having breakfast, you can meet other travelers. I got some friends at the hostel. It was pretty Great stay. It’s my third time at this hostel. Everything was perfect as usual. I came back like at home. Love you, guys! Our stay was so good, the staff are so lovely and friendly, rooms and other areas are clean, breakfast was good and the location of this hostel is perfect, it is very accessible wherever you go in the city like mall, etc. It was second time I stayed in this hostel (first one was 2 years ago). Hostel again left good impression. It is very clean, comfortable bad, staff is polite and nice. Don't want to look for other hostel if I need to stay in Tbilisi again. This one is perfect.